Everyone loves ice cream sandwiches, these are quick and easy to make at home and even suitable to get the kids helping. If you don’t have time to make the cookies, try using a store bought chocolate cookie. The soft chewy ones work best. For a dinner party or special occasion, try adding 85g of chopped pistachios to the ice cream instead of the chocolate chips. Preheat oven to 180°C and line a baking tray with baking paper. Cream the butter and sugar in a large bowl until light and fluffy. Add the egg and mix well. Sift all remaining dry ingredients and gradually add to the butter mixture until the biscuit dough comes together in a mass. Roll heaped teaspoons of the dough into balls and place 5cm apart on the tray. For oversized ones use a heaped tablespoon. You will need to do this in batches of 6-8 depending on your tray and oven size. Bake for 8 minutes then let cool on a rack. While the cookies are cooling, remove the ice cream from the freezer and allow to soften slightly, do not let melt. Chop your strawberries into small pieces, random chunks will be fine if the children want to help with this under supervision of course. Mix the strawberry pieces and the chocolate chips through the ice cream and put back into the freezer so that it can become firm again. 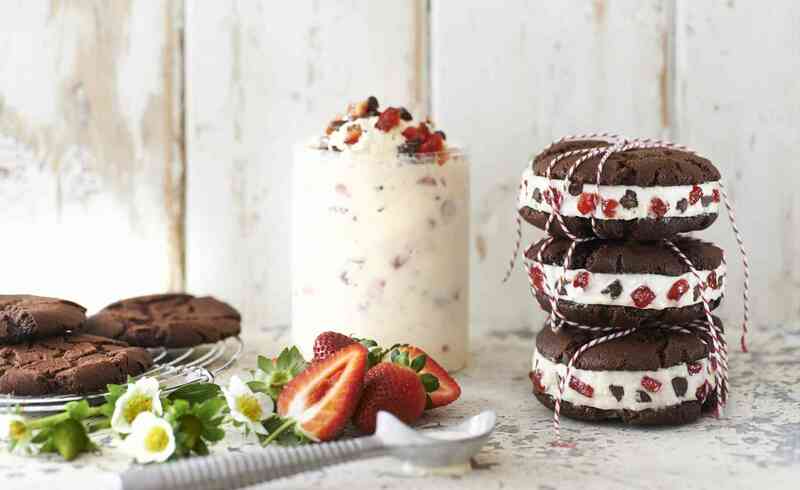 Place a big scoop of ice cream onto a cookie and then top with another cookie, gently pressing down to squish the strawberry ice cream out to the edges. Take care not to break the cookie and not to let the ice cream ooze out from the sides. Place the strawberries & cream cookie sandwiches back in the freezer until ready to serve.